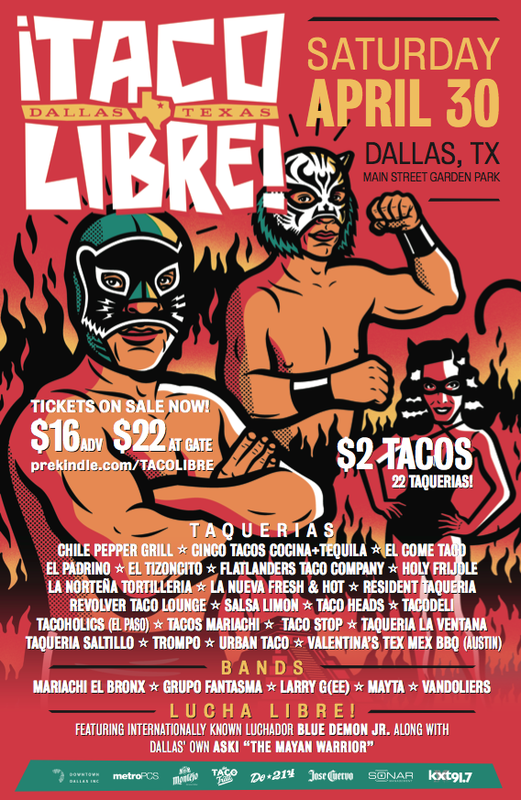 Taco Libre is just 5 days away! 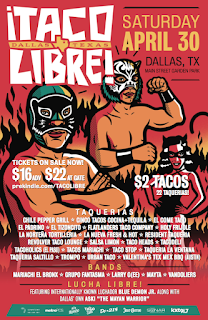 This event features 22 taquerias, curated by Jose R. Ralat, writer of the Taco Trail blog. Taquerias will be coming from as far as El Paso and Austin and serving a range of styles from authentic street style to contemporary. Each taqueria will have a $2 taco option and are encouraged to have a vegetarian offering. There will also be musical entertainment by Mariachi El Bronx, Grupo Fantasma, Larry G(ee), MAYTA, and the Vandoliers. Matthew Brinston, a local artist, will be doing a large scale "Alive-Painting" during the festival. Authors of the Taco Cleanse, Stephanie Bogdanich and Molly Frisinger, will be doing a book signing, as will author of La Tacopedia, Alejandro Escalante. And last, but certainly not least, Luchador Blue Demon Jr. will be stepping into the ring at Taco Libre!